The story of Eddie Van Halen’s involvement with Michael Soldano is limited and brief. Given that over time, Eddie noticed that his Marshall Superlead amplifier was losing its power in terms of tone, Eddie needed a new way of keeping his sound alive. 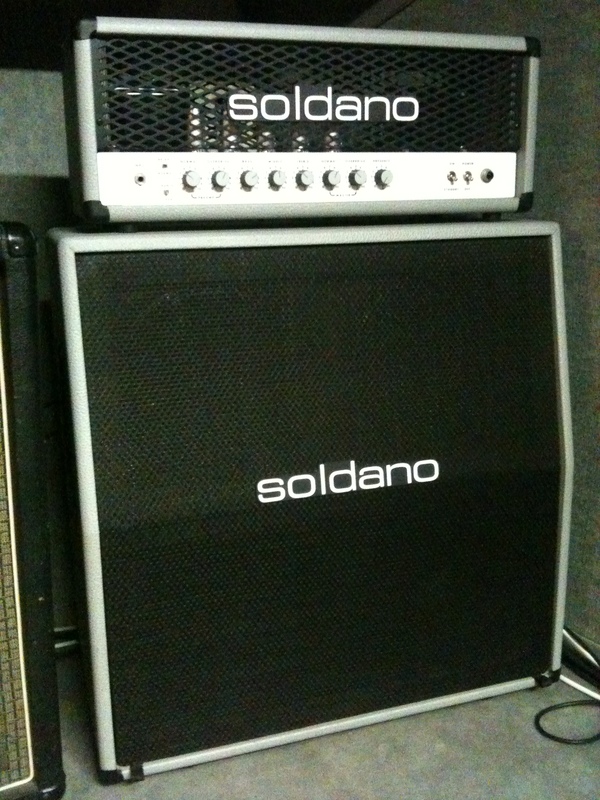 Soldano Amplifiers have been around for some time, and are custom built in the Soldano factory. In an attempt to remedy this problem, Ed decided to give a call to Michael Soldano. Soldano worked nearby where Eddie lived at the time, so it was convenient to him to travel down to Michael Soldano’s workshop and pick up a Soldano SLO-100 amplifier. Soldano himself had built up his reputation beforehand as a gigging guitarist and a “Mr. Fix it” style attitude around the west coast for amps. He and Eddie Van Halen perhaps saw the stroke of genius in each other. 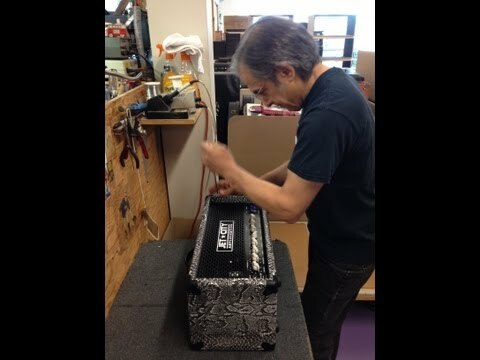 When Eddie Van Halen sent in his faithful Marshall to be fixed to Soldano, he replaced the tubes in his Marshall. However, in the meantime, Eddie fell in love with his SLO-100 and used it as a transition amp between the Marshall Superlead and his first line of branded amps, the Peavey 5150 range. Michael Soldano is an intelligent man when it comes to understanding amplifier design. Was it a necessary move on Eddie Van Halen’s part? Most likely. It seemed that listening to the amp and setup that Eddie Van Halen had used from the 1984 album onwards, it was losing its power. 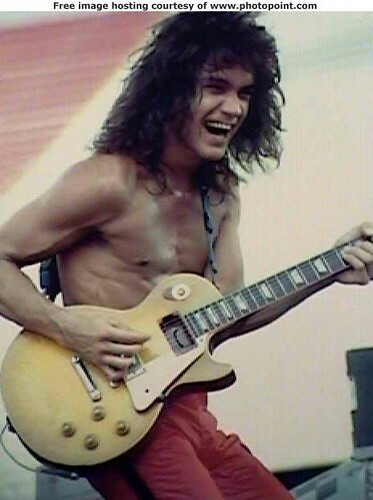 The sensible thing for Eddie Van Halen to do at this point was to search for a new sound, using the SLO-100. Strangely enough, the Variac used on the Marshall amplifier, boosting its tone, killed the tubes in the long run. This was due to the fact that using a lower output of voltage via the Variac killed the operation of the amplifier by adjusting the settings of the tubes, making them burn out more quickly than usual as they were not operating at a normal rate. 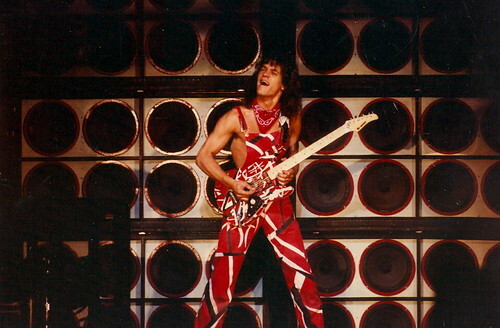 Eddie Van Halen used his SLO-100 most notably on the vast majority of For Unlawful Carnal Knowledge. He also used his old Marshall (although repaired) and a prototype Peavey 5150 on the album, but for the most part, it was the Soldano sound that made up most of those songs on that album. The amp itself is an interesting piece of work. It is run on preamp and power tubes, with two channels: Normal and Overdrive. Features include preamp gain, footswitch between channels, bright/clean/crunch switch on the normal channel, plus a two channel tube-buffered effects loop and an additional slave output. 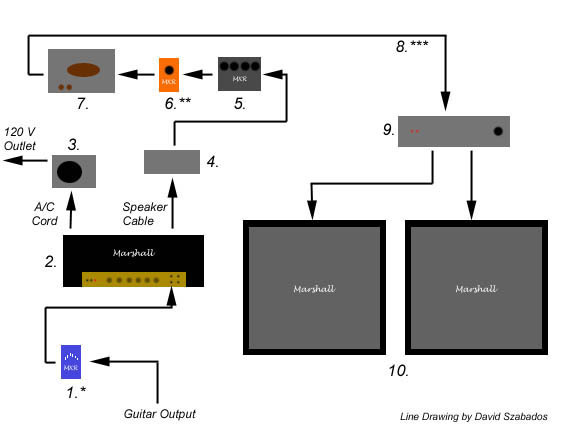 A rotary Impedance operation also allows the use of 4, 8 or 16 ohm speaker cabinets. The SLO-100, although not cheap, will enhance your own understanding of the Brown Sound that Eddie Van Halen sought to progress with around the For Unlawful Carnal Knowledge era. Eddie lost interest in the limitations of the Soldano Amp, noting that the high gain channel was not favourable to him by the time he had developed the Peavey 5150 range of amps. Still, it was another step towards truly being a master and artist of his sonic craft at hand. 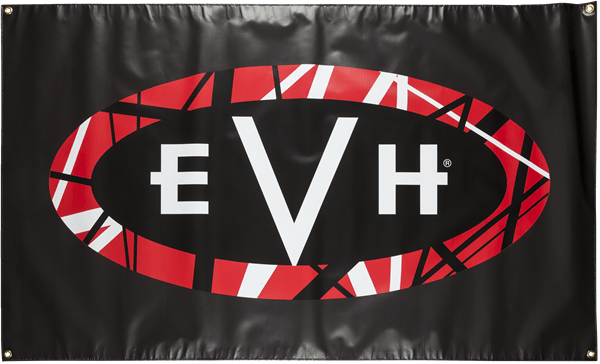 Eddie Van Halen was just beginning to develop his truly unique sound in terms of marketing and design. 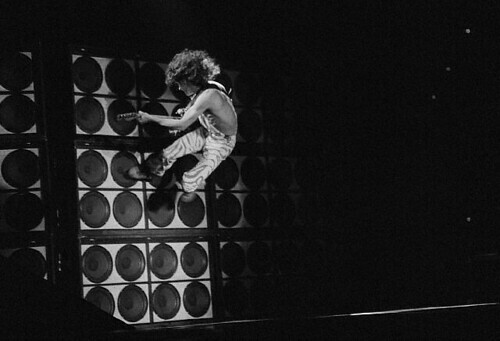 Although perhaps in transition mode, Eddie Van Halen was one step away from creating his own amplifiers. This entry was posted in Guitar, Music, Rock, Sound, Technology, Van Halen and tagged Brown Sound, Eddie Van Halen, Marshall, Michael Soldano, SLO-100, Soldano, Variac on September 23, 2015 by chrisairey01. It is somewhat known that Eddie Van Halen’s first guitar that he purchased was actually a Teisco Del Ray that he purchased for $110 from Sears courtesy of his job on the paper route1. He is quoted in an interview as stating that he purchased that particular guitar as he said “I used to think the more pickups, the better!”2 which he found appealing at the time. Eddie chose to play the guitar after his brother Alex played his drum set as he was out on his paper route and eventually topped him in terms of skill. Eddie eventually picked up his brother’s guitar and began playing it after this occurred, shortly buying his first guitar afterwards. Early on in his days as a guitarist he quickly became a fan of Cream, and more specifically, guitarist Eric Clapton. It is noted that Eric Clapton favoured the classic Gibson Les Paul guitar, strangely enough out of production at the time3, being replaced by what would eventually become the modern day Gibson SG. He sought out a Les Paul that some blues artists had been using, and played it on the well-known and critically acclaimed John Mayall’s Bluesbreakers with Eric Clapton album with a Marshall amplifier. He later joined Cream. 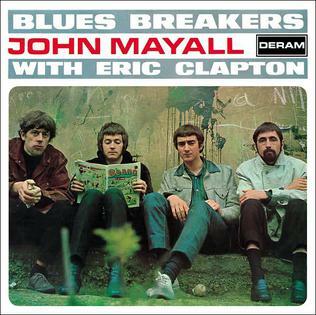 The cover of the highly influential John Mayall’s Bluesbreakers with Eric Clapton with Eric second from left. Eddie is quoted as saying: “Clapton was it. I knew every note he played.”4 Indeed Eddie is a huge Eric Clapton fan! So a knowledge of the sound Ed was pursuing began from day one came originally from his records that he loved. He loved the sound of Eric Clapton’s guitar playing and practiced constantly in order to achieve the sound that he wanted. But still, it wasn’t enough. Now, before I rush into any complete history of Van Halen, I must cover the Les Paul and what it is. You can pick up a firsthand USA Gibson Les Paul for around $3 000 US for the 2014 model. Now given that, it is an excellent guitar (and no, I am not biased) and is a good way to start with following that classic Van Halen sound. But what exactly can I do in terms of an amplifier? You may be asking that question yourself. 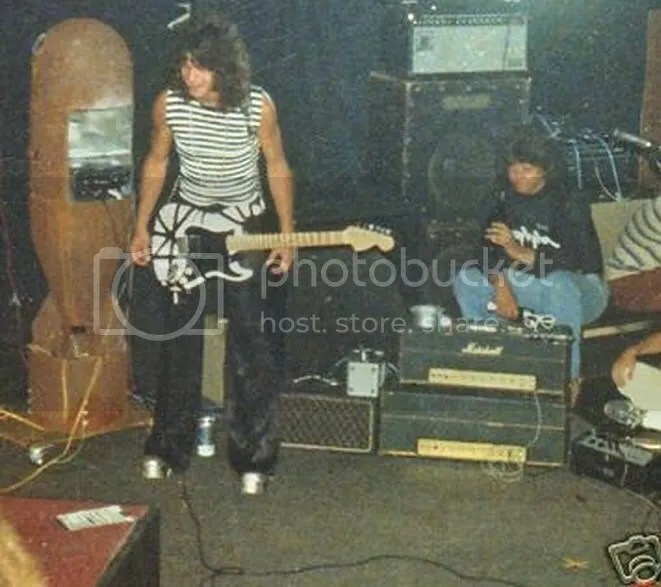 Well in the early days of Van Halen Eddie used Marshall Amplifiers, so let’s take a look at those. Marshall Amps are the way to go for the early Van Halen sound. Marshall Amplifiers were famously designed the way that they were because of the involvement of Pete Townshend of The Who. He was looking in the early 1960s for a brand of amplifier that was louder and heavier than the typical Fender or Vox A30 amps of the time. Discussions were held between Townshend and Jim Marshall, and the rest is history as they say. But to be clearer about the history of the amps, other guitarists were searching for the Marshall sound at the time. So although Pete’s contribution is not to be underestimated to the Marshall sound, he was not the only one in assisting the amps to become one of the largest international brands of amplifiers today. Many Marshall Amps are sold at various sizes and prices, but spending around $500US or more on a basic amp should do the trick. Remember, this is a lot of money to invest. It is NOT for people who do not take the guitar or the music of Van Halen seriously! 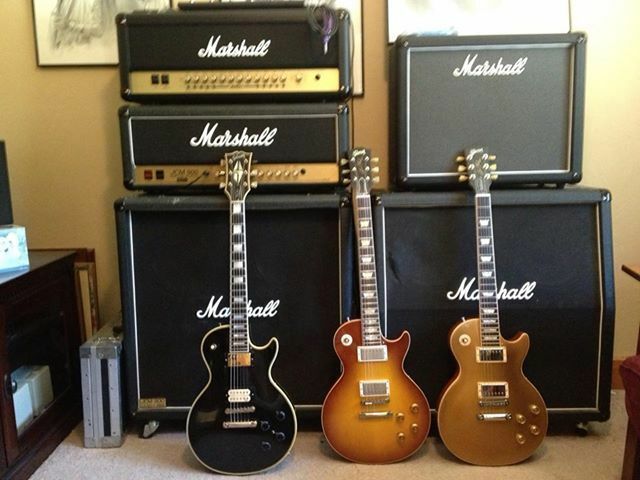 In any case, if you were to look at the basic very early Van Halen set up, then a reasonable Gibson Les Paul Standard and a basic (but not too basic) Marshall amplifier will do the trick. Once again however, I must stress that you will need to play like Ed as well as use the setup to complete the sound. It is noted that Eddie in the early days of Van Halen, before constructing the legendary Frankenstrat Eddie had three main guitars at his disposal: Gibson Les Paul; Fender Stratocaster and the Gibson ES-335. All three he experimented with before building the first Frankenstrat guitar. A Gibson Les Paul and a decent sized Marshall amp should get you the ‘classic’ rock sound, much like what Eddie was looking for very early on. An alternative is the Gibson Les Paul Axcess, which has a Floyd Rose tremolo built into it. But it is a little pricier, around $4000US. But still worth your while if you feel up to purchasing one. Eddie has always been a fan of the Floyd Rose tremolo, and is worth seeking if you are on a budget. The Gibson Les Paul Axcess is another modern day alternative to consider. Another thing to add is that the Gibson Les Paul has gone through some significant changes over the years, and if you are really going after the classic rock sound, you may need to seek out an early 1970s model of Gibson Les Paul, which is much more difficult to find and may cost a lot more. Eddie stated in a more recent interview that he used a Gibson Les Paul Goldtop, just like what Eric Clapton used. Just remember that it is highly unlikely that Eddie used it ever on any recording. But it is essential to explore this wonderful guitar to gain a deeper understanding of what Eddie was exploring at the time. In any case, I hope that I have provided enough information for you to get started. Remember, you will still need to play like Ed as well as use the equipment that he used in order to sound like him. This entry was posted in Guitar, Music, Rock and tagged Cream, Eddie Van Halen, Electric Guitar, Eric Clapton, Floyd Rose, Gibson Les Paul, Les Paul Axcess, Marshall on September 3, 2014 by chrisairey01.